(From top left) Bundi waiting on my throwing the ball in the garden. Walked to the beach today with my hairy boys and my boyfriend. Finished reading a James Bonds- always exciting. This weeks magazine reading with the new company and asos magazine. Summer nectarine sponge (recipe to follow this week). Going up a size is giving me the excuse to buy lots of nice new underwear. Serious face before a family dinner on Friday. Made my first smoothie of the year- my favourite summer treat. I wouldn't have said this week was a busy one however I seem to have filled it with lots of photos. During the week I didn't do much apart from my weekly Wednesday trip to Scotts. We had planned to go out for a walk however the silly rain prevented that so we just had a duvet night and a chippy tea which was very naughty of us! Oh I also met up with my best friend who I've been separated from for about 5/6 months which is a very long time for someone I used to see everyday. We went out for a bite to eat and chatted for ages and ages and I am more than happy to report he hasn't changed one bit. I've been trying to spend more time outside enjoying the sunshine and the garden while reading my book. The second time I tried it though I felt a bee land on my head. I wasn't sure if it had gone so I went inside calmly for a comb and which I started brushing it stung me. Alone in the house it sent me into a bit of a panic and it f**king hurt!! On Friday my aunt and uncle came round because they wanted to have a wee celebratory tea because my brother has now finished school and hopefully I will be going to university in September. They treated us to a Chinese takeaway and quite a few bottles of cider which turned into a really nice night. On Saturday morning mum suggested going to do a little shopping which of course I would never turn down even though I have very little money. 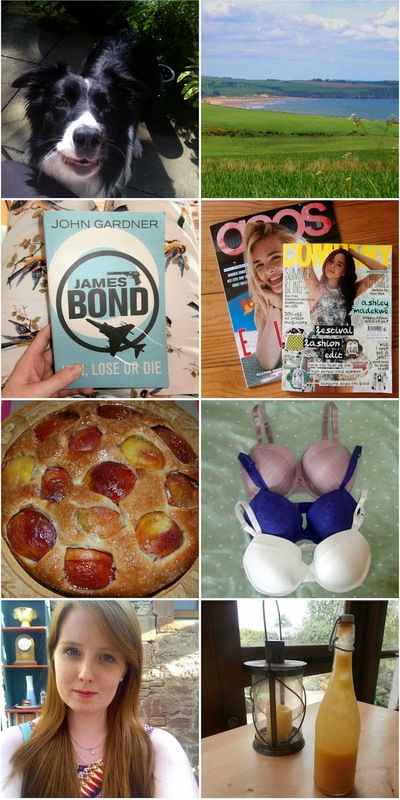 I didn't get much apart from some me underwear which I love and some books... That sums me up quite well to be honest. We also had a cheeky KFC to add to my unhealthy week. Today Scott was round today as is getting a bit of a habit. We walked the few miles to the beach and threw sticks to the dogs while I tried to get him to take outfit photos... You'll see them on Tuesday though. He stayed for a BBQ and hasn't long left hence why this post is so late. Hope everyone had a good weekend and as it is the first on the month please check out my new June advertiser The Life of Dee. Looks like you had a lovely week. The beach looks beautiful!